While Europe got an English-language version of 'Hallelujah' in 1979, after Milk & Honey won the 1979 Eurovision Song Contest, France got their own release of this song. The single featured a French and Hebrew version of the song. Especially the French version is a rarity, since it was released in France only. I ordered this single from France, since I never saw it here. I'm currently in the process of compiling alternate language versions of Eurovision winners on cd, and most of them appear on websites for download - but this one is extremely hard to find. 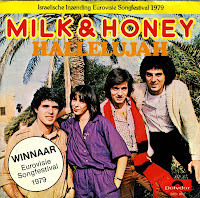 'Hallelujah' was the winning song of the 1979 Eurovision Song Contest, performed in Hebrew by Milk & Honey, representing Israel. The group was created especially for the contest after the song's original performers, the band Hakol Over Habibi, declined the opportunity to sing the song. The song is a slow-building ballad, with the group praising God for the world and all the good things in it. This is, to date, the most religiously-themed song to win the Contest. In the Netherlands, the single reached number 8 in the Dutch Top 40, and in many European countries, the song became a standard. It is even recognized by many North Americans who might never even have heard of Eurovision.